I found myself working in Excel as part of the work I did fitting exponential (and gamma) distributions to left censored data. This was partly due to do the fact that my research colleagues had done the initial distribution fitting using Microsoft Excel’s Solver to do maximum likelihood, something it does quite well. A shortcoming of this approach is that you cannot get the Hessian matrix for models with two or more parameters which you need if you want to place any sort of confidence interval around your estimates. There is nothing stop you, of course, from doing the actual mathematics, and calculating the values you need directly, but this all sounds like rather too much work and is distribution specific. One can equally make the criticism that the approximations used by the BFGS and other quasi-Newton methods are not guaranteed to be close to the true Hessian matrix. The next step along the chain (I am sure this is a terribly mixed-metaphor but hey who cares), for me at least, was to use MCMC — in particular, to implement a simple random walk Metropolis-Hastings sampling scheme. Note: The method I describe here is almost impossible for a multi-parameter model, or a model where the log-likelihood does not reduce to a simple sum of the data (or a sum of a function of the data). The reason for this is that Excel’s distribution functions are not vector functions, which means in many circumstances the values of the likelihood for different observations must be stored in separate cells, and then we have to sum over the cells. In a problem with n observations and m proposals, we then would have to store \(n\times m\) values unless we resort to Visual Basic for Applications (VBA). However, I wanted to do this problem without VBA. Note 2:I know that it is very easy to estimate the variance for the exponential distribution, but please refer to the title of this post. In order to do MCMC we need to be able to generate random numbers. This functionality is provided in Excel by the Data Analysis Add-In. However, the Data Analysis Add-In has not been available since Excel 2008 for the Mac. There is a claim that this functionality can be restored by a third party piece of software called StatPlus LE, but in my limited time with it it seems a very limited solution. There are number of other pieces of functionality missing in the Mac version of Excel, which reduces its usefulness greatly. which depends only the sum the observations above the limit, the sum of the logarithms of the observations above the detection limit, and the number of observations above and below the detection limit. In my JAGS model I used a \(\Gamma(0.001, 0.001)\) priors for \(\alpha\) and \(\beta\). This would be easy enough to implement in Excel if the inverse Gamma function was sufficiently robust. However, it is not, and so I have opted for a prior which is \(U(-2,3)\) on log-scale. This prior is a little less extreme than the \(\Gamma(0.001, 0.001)\) prior but has reasonable properties for this example. We can use the Data Analysis Add-In to generate a set of proposal values. The screen capture below shows the dialog box from the Random Number Generation part of the Data Analysis Add-In. We need proposals for both \(\alpha\) and \(\beta\). Therefore we ask Excel to give us 2 random variables. In a standard MCMC implementation we usually choose a “burn-in” period to make sure our samples are not to correlated with the starting values, and to give the sampler time to get somewhere near the target distribution. In this example we will use a burn-in period of 1,000 iterations and then sample for a further 10,000 iterations, for a total of 11,000 iterations. We get Excel to put the proposals out into columns B and C starting at row 2 (and extending to row 11,001). 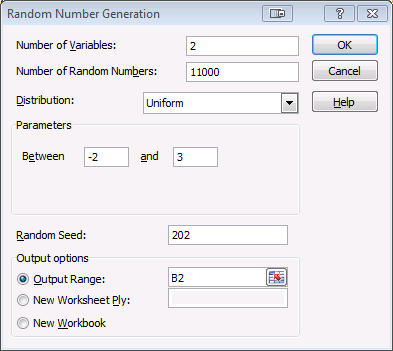 Note: I have set the random number seed (to 202) here so that my results can be replicated. We also need a column of U[0,1] random variates for our Metropolis-Hastings update step. The screen capture below shows the dialog box how we set this up. We store these values in column F, and as before I have set the random number seed (to 456) so that my results can be replicated. into cell D2, and then selecting cells D2 to D11001 and using the Fill Down command to propagate the formula. We select the range D2:E:11001 and use the Fill Right command to propagate the formula formula across for \(\beta\). 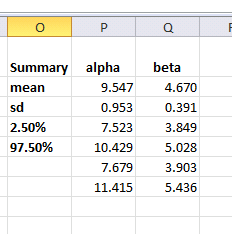 Columns C and D contain my proposal values for \(\alpha\) and \(\beta\). As noted before, all we need to is the sum of the observed values and the sum of the log of the observed values, plus the number of observed and censored values. The sum of the observed values in my data set is 1478.48929487124 (stupid accuracy for replication), and the sum of the logs of the observed values is 519.633872429806. As noted before the number of observed values is 395, and there are 9,605 censored values. I will insert these values in cells I2 to I5 respectively, and in cells H2 to H5 I will enter the labels sum_x, sum_log_x, nObs, and nCens. It is useful to label cells with names when working with Excel formulae. This allows us to refer to cells containing values by a name that means something rather than a cell address. We can define names by using the tools on Formula tab. I will use this tool to assign the names I put into cells H2 to H5 to the values I put into cells I2 to I5. To do this I select the range H2:I5, and the I click on the Formula tab, then the “Create names from Selection” button as shown in the screenshot below: Note I do not believe you can do this on the Mac, but I do not know for sure. Excel (Windows) allows you to create multiple names in a spreadsheet at once. I can now use, for example, the name sum_x to refer to cell address $I$2 in my formulae. It also removes the need to make sure that the address is absolute every time I type it. After you have got this formula correct (and it will probably take more than one go), then select cells J2:J11001 and use the “Fill Down” command (Ctrl-F on Windows) to propagate the formula down for every proposed value. is cells L3 and M3 respectively. We need to propagate these formulae down to row 11,001 by selecting and using the “Fill Down” command as before. Finally, we need to gather some summary statistics about our sample from the posterior distribution. Recall we are using a burn-in period of 1,000 samples and a sampling period of 10,000 iterations. Therefore all our summary functions are only applied from row 1,002 to row 11,001. We are interested in the mean, standard deviation, and 0.025 and 0.975 quantiles for [latex]\alpha\) and \(\beta\). We can get these values using the AVERAGE, STDEV.S, and PERCENTILE.EXC functions. In cells P2 to P7 we insert the following formulae. and then we select cells P2:Q7 and use the “Fill Right” command. The screen capture above shows my results. 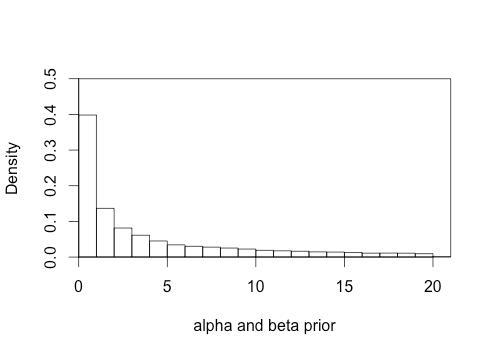 Rather embarrassingly the 95% credible interval does not contain the true values \(\alpha=10.776\) and \(\beta=5.138\). The main reason for this is that there is a total of 10 acceptances in our sample of size 10,000! That is, the sampler is incredibly inefficient. This is not completely surprising. The interval calculated under the assumption that the posterior distribution is symmetric is a little wider and does contain the true values. However, I would not put much stock in this. 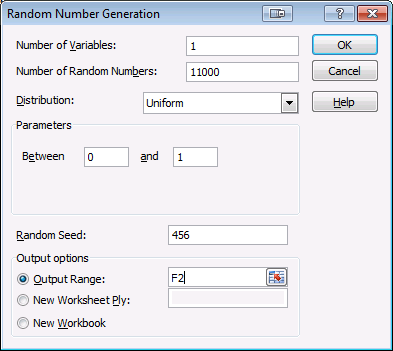 Of course, we can easily have the sampler run for a longer time, by generating more random variates and using more cells. I will leave that task to the reader. In this article I have shown how to fit a gamma distribution to left censored data using MCMC in Excel. It is definitely not the best way to do this — I would use R and JAGS, which would be infinitely faster and give me more useable results — but it can be done. It does offer functionality to non-R users, of which there are many more than actual users, and it also allows the chance to observe the Markov chain so that we can see how the sampler is working at every stage of the process. For completeness the sheet I created whilst writing this post is available from the link below.